Thursday afternoon, I ran into the mother of the realtor who helped me find a place to live when I moved. (She -- the mother -- works at the Main Library, so this wasn't a real surprise.) Talking to her reminded me that my realtor's baby is due next week! I finished the cap yesterday, which is some kind of record for me. I'm still not crazy with the way the orange pooled, but it's cute, and any baby born in Iowa in January certainly needs an earflap hat. All that's left to do is attach the I-cord ties. 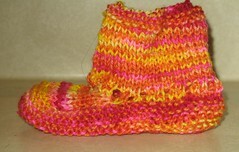 So, with lots of yarn and some time, I decided I should do a pair of booties, too. With Ravelry's help, I found several free patterns, and decided to go with this top-down pair from Megan Mills. 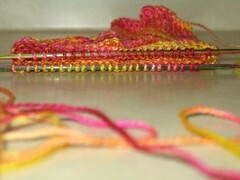 This will teach me to read through the pattern more closely -- it looked like a sock and it was knit from the top down. It would be a snap! Actually, it wasn't really very hard at all, but instead of grafting the toe, you graft the whole length of the sole -- 48 stitches to Kitchener. Y'all may remember how I dislike Kitchenering, even after a very good lesson by my friend Becky last summer. However, I got out the post-it note with the instructions from Becky, and grafted the first bootie at 12:30 a.m. this morning. And I think I've got it -- Kitchenering that many stitches, over and over, may have set it in my brain for good. I did the second one earlier this evening, with almost no panic! 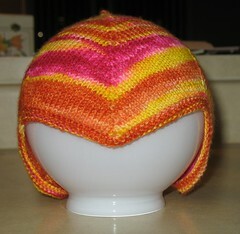 I like the finished booties better than the cap -- less orange pooling. I went to Joann's this afternoon and bought both pink and orange ribbon, so all I've got left to do is decide which color to use. Very cute! And both completed impressively quick! Those are super cute, especially the hat. I think the pooling looks cool. I hate grafting too. For some reason, it makes my wrist hurt. Yea! I'm so proud of you! I learned a new technique recently - knitted a sock toe up with short row heel. No Kitchnering for me :) You coming to Chicago and/or Dallas? Cedar has gone for now (thank you, God, for rain) and I feel human again, and it's manifesting itself in me cracking up over EVERYTHING. Including the hat on the light fixture! And how is Honeybee coming? HINT HINT! It's cold down here! My office is a freezer! 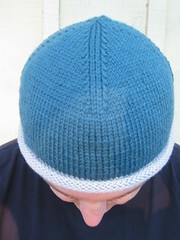 funny, I am also knitting the very same cap! it is cute! !